"Intermission wedding." Use the Bavarian Belle as a venue for your wedding ceremony. 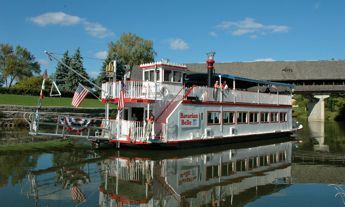 Between any of our scheduled daily tours we offer the upper deck of the Bavarian Belle for your wedding ceremony. Seven days a week $450.00 for twenty minute ceremony and ride along on the next tour if you wish (up to 50 guests, $11.00 per person for any additional guests) . This option is ideal for a small informal ceremony. Full wedding ceremonies or wedding receptions fall under the Group Option 2 (listed below). Group Option 1 "Ride Along Option"
Reserve a block of tickets for your group on one of our regularly scheduled tours. For groups of 20 or more, the ticket price is reduced from $12.00 to $11.00 per ticket. Group Option 2 "Private Tour Option"
One hour private charter, which gives your group exclusive use of the Bavarian Belle for one hour – $850.00 (Mon-Thurs. ), Weekend (Fri.-Sat.-Sun.) – $975.00 for one hour. Extensions of one hour rental will be billed at the hourly rate and can be billed in half hour increments.